All web UIs can be grouped into two (2) based on their functions. Widgets that help to display data/content: For example, the tab widgets help to display content in a limited space on a page that would have otherwise required a number of pages. Collect user input (Form input elements): Some inputs required from our visitors to our websites require a specific format. For instance, you may require a user to enter a date in a specific format. 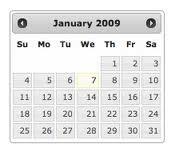 The jQuery DatePicker can help in this case. We can also make mention of the numerous WYSIWYG editors that transforms a simple textarea. //tag representing the UI widget. To develop the base class for widgets that fall under category two(2), we will create a class name JsInputWidget which will subclass our JsWidget. When developing in Yii, an instance of CModel is usually used to collect user inputs. JsInputWidget will be given a CModel to work with. The following properties and methods are defined for our JsInputWidget. * @var CModel the data model associated with this widget. You can download the classes to see the implementation of methods associated with each class.